The whole idea of jewellery is to uplift an attire and make the jewellery wearer stand apart from the others. And it quite obvious that jewellery lovers will always be on the lookout for new styles and inspirations to add to their collection. They don’t want to miss a chance to flaunt a new piece of jewellery or wear a fancy jewellery before others enjoy the thrill of doing the same. If you are also looking for jewellery inspirations just like a million others, then what better place to search for them than in the movies. Cinema lets us live surreal lives and watch surreal stories, and that is precisely why we love it. Over the years, movies have given some mind blowing jewellery trends to the world. And just like the movies that feature them, these jewellery pieces are also epic. We have selected 10 such jewellery instances from movies that will leave you awestruck and inspire you to make them a part of your collection. Here is the list. We bet, you won’t settle unless you lay your hands on them. The movie Titanic has been a symbol of love for over two decades now and at the very heart of the story has been this blue sapphire pendant. Well known as ‘The Heart of the Ocean’, this popular pendant was worn by the mesmerizingly beautiful Kate Winslet (Rose) while Leonardo DiCaprio (Jack) was drawing her portrait in one of the most memorable scenes in the history of cinema. The pendant also symbolizes the tragic sinking of the ship Titanic and would make for a historic yet classy addition to your jewellery collection. Yes, Lord of the Rings movie fans would be well versed with these lines. These are inscribedon the one ring (the all-powerful magical ring) which is central to the plot of the movie which shows the quest to destroy this ring so that it is not misused. So was it destroyed? For that you will have to check out the movie. 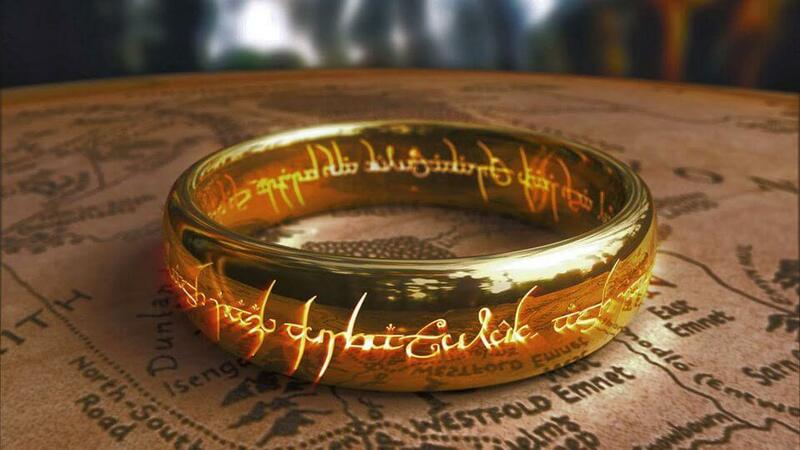 But whether it was destroyed or not, you can definitely own a replica of the one ring from AuGrav. From fun to sorrow, Bollywood songs have got everything! Sometimes, they even showcase magnificent pieces of jewellery. One such song is the ‘Dilliwali Girlfriend’ fun number from the movie ‘Yeh Jawani hai Deewani’. The song features Deepika Padukone in a spicy appearance and she is seen wearing a striking pair of Kundan earrings. The earrings are a visual delight and could serve as perfect accents for your traditional dresses. Yet again, it is Deepika Padukone. But this time it is different movie. The Shahrukh Khan starrer ‘Chennai Express’ saw Deepika Padukone in a South Indian role where she sported some immaculate South Indian bridal jewellery. Deepika pulled of these temple jewellery designs like the diva that she is and have inspired many others to do the same. Before we even realized, Alia Bhatt became a house hold name from the Bollywood film industry. Her current stardom has a lot to do with the perfect role she played in the movie ‘2 States’ of a South Indian girl Ananya. 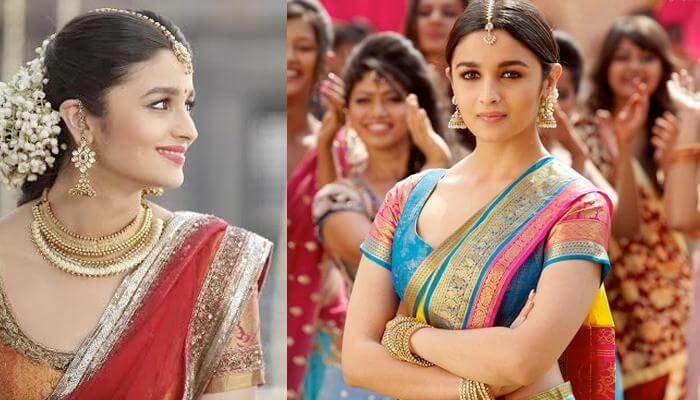 While Ananya is seen wearing minimal jewellery during the first half of the movie, the second half showcases some exquisite South Indian jewellery that every woman will be proud to wear. Moving back to Hollywood! Very few movie buffs would be unaware of the brilliant performance Julia Roberts gave in the movie Pretty Woman. The movie was a delight and so was Julia Roberts in the movie. But what caught the attention of the fashionistas all over the world is the magnificent necklace Richard Gere gifts Julia in one of the scenes during the movie. The ruby and diamond necklace looked stunning on the actress and the scene is still remembered for its warmth. When talking about fashion divas, it is difficult to not mention Aishwarya Rai. She is stunning and so are some of her brilliant performances like the ones she displayed in the movie Jodha Akhbar. The movie takes us to the times of the Mughal empire and Aishwarya is seen wearing some vintage jewellery pieces that perfectly echo the historic times that the movie was trying to depict. It would not be wrong to say that Anushka Sharma has taken Bollywood by storm. Always in the limelight for her relationship with Virat Kohli, Anushka has given some meaty performances in her short career. One of them is ‘Jaggu’ from the movie PK. The performance was awesome but what caught our eyes the most were the cute earrings she wore in the movie. These are not extravagant as some of the others on the list but are unique enough to make it into any fashionistas collection, especially the butterfly earrings. The song chamak challo has been a coming of ages song as far as Bollywood was concerned. It saw the famous popstar Akon collaborating with the music directors and providing the vocals. Amidst all this, Kareena Kapoor swiftly but surely took away the limelight with her breathtaking performance. Her sensuous attire coupled with some fascinating jewellery, made her look like a million dollars. The jewellery was just breathtaking! Don’t believe us? Take a look yourself. If you are a girl who likes minimalistic attires and jewellery even while going traditional, then you would have definitely loved Kajal Aggarwal in the movie Singham. Her bubbly acting in the movie was adored by everyone and so were her beautiful classy earrings. Take these ethnic earrings for example, they are out of the world and compliment her attire in a subtle yet classy manner. Looking For Jewellery Ideas? Movies Would Be A Good Place To Begin With! Overall rating: 4.7 out of 5 based on 235 reviews.